Cast your little one as the fairy hero in this enchanting personalized book. 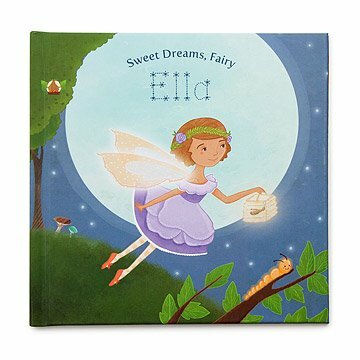 Give your little girl's imagination wings and cast her as a sweet fairy with this lovely personalized book. Filled with details like name, skin tone, home town, and more, this magical story shows a day in the life of your fairy child, complete with a supporting cast of her two best friends or family members. Complete with a special dedication from you, your child will delight to see her name alongside this adorable little fairy and her charming pet, the glowworm, who acts as a nightlight when she's ready for sleep. Hand bound in the USA. Please note: at this time this book is only available with female characters. I bought this book for my granddaughter's second birthday. It was adorable! I would buy or recommend this product . I will buy this for my grand niece and new grand baby! Love that I can select her favorite color for the fairy's dress. We included the name of her cousin and aunt to be included in the story. So wonderful! Love the quality of this personalized book. Hard cover, quality paper for the pages, love including family member names! It peaked her imagination. She just loved it. This is just so adorable how you incorporated my daughters name along with her two best friends to create a fun story. The illustrations are fantastic and fun. The story line is very relevant to what my daughter is into right now, so the book will come at a great time. Perfect for my niece. Sweet little book with fun personalizations throughout. Can't wait to give it to her! Love this! I want to get it for every little girl I know! This book had even more personalized details than I thought .... it is so cute & well done! Will be getting this again for birthday gifts for my daughters friends!